How hard is that spinning Cindy? 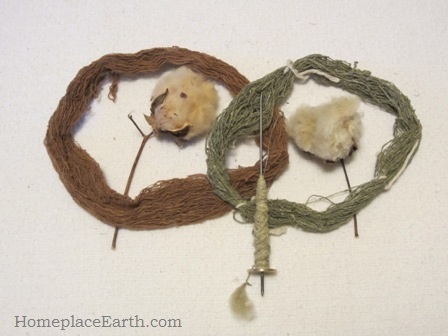 I have some alpaca fiber from my 3 alpacas that is ready for spinning – already skirted and carded. I have been approaching different people to have it spun for me – I do not have any equipment for spinning. Terry, I’m sure you can do it. There is a fiber festival coming up April 27 in Powhatan, VA. http://www.powhatansfestivaloffiber.com/ It is a good opportunity to meet people with alpacas and folks into spinning. Clothos Handspinners will be there in a tent, making themselves available to demonstrate spinning, answering questions, etc. You could get a quick lesson. I’m sure vendors will have spindles to sell, unless you are interested in a wheel–and there will be those there, also. Those colors are amazing, Cindy. I’d eschew dyed clothes forever for those tones. I was pleased with the colors, too–so much deeper than when harvested. Good for you that you’ve tackled spinning cotton! And wise of you to recognize that you’ll never know any better than for that to be your normal. Don’t let people talk you out of the spindle. Even though I do most of my spinning on a wheel now, spindles are perfect for travel and when you just want a bit of a certain yarn NOW for what you’re in the middle of (a few days ago I spun a few yards of angora for a project I’m in the middle of). I have a charka, but have never done much with it, since so much warm animal fiber comes my way and I’m more in need of warm things, but if I ever use up the cotton yarns I have in stock and live in a warm climate, I’m prepared with the machine I need. I also weave, so want to remark that I can’t tell for sure from your picture if you plied your yarn. Especially when you weave, plied yarn is easier to work with. It’s stronger, generally a more even diameter, the weave structure stays square, it holds up to the abrading of the reed better, and it’s heavier, so the weaving goes faster. Especially if you’re spinning a short staple cotton, singles tend to be weak and break, although they’re more acceptable as weft. 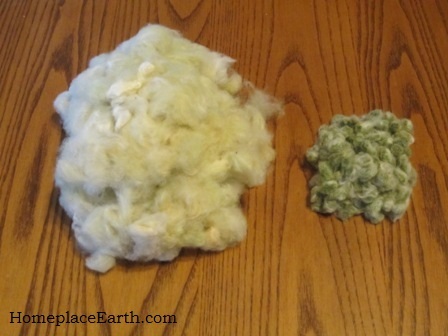 Also, I don’t know specifics about the cotton you’ve grown, but I do know that there are varieties with longer fibers, which would both be easier to spin and give a smoother yarn (fewer fiber ends to fuzz per inch or whatever), If that’s not what you grew, you might search out one of them. Is flax for linen next on your list? I don’t think it needs such a long season. I love your blog. You’re a huge inspiration to me! To Terry: if your local spinning guild doesn’t yield someone to spin for you, let me know. Depending on details (quantity, how soon you want it, …) I could do it or find someone who would. Better for you not to have to ship it, though (I’m in WV). 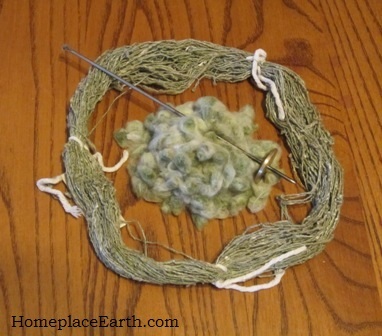 How hard it is: spinning is the hardest thing I’ve ever worked at mastering, and alpaca is slick, so, like cotton, requires more skill than spinning wool. Eve, thanks for your comments. The cotton in the knittted sample was plied, but all the other spun cotton in the pictures was singles. 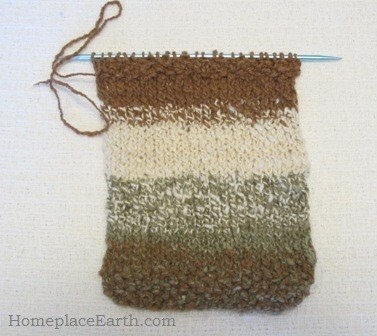 Especially with my uneven spinning–although much improved from when I began–I’ll be plying what I’ll be weaving. The Nankeen Brown cotton is shorter than the white. It’s always good to get out of our comfort zone and learn something new and I’m having a good time doing it. I’ve got my hands full with cotton right now and have not entertained any thoughts about flax. Some of the members of my spinning group are very knowledgable about using natural dyes. Flax and dye plants certainly have a place in a permaculture garden. I don’t believe I’ll ever be without something to do. I just purchased my first cotton seeds this year from Bountiful Gardens. I was totally unaware of there being different colors. I truly enjoyed your sample. There’s no need to dye! Truly beautiful. Growing cotton is an interesting experience. Once you have a harevest, you’ll have to acquire a spindle learn to spin. The cotton seeds that I recently planted are coming up really good. Seems like every day they are growing!! Much better then my tomato plants. My cotton plants are the first things up in my coldframe, ahead of everything else, except maybe the zinnias. It is exciting to have something grow so fast. What is the best way to dry out some cotton bolls this time of year. I’m going to try and save as many of the bolls as I can. Lori, this was a tough year to bring cotton to maturity. I planted cotton at the same time as I did in 2012 and when the frost hit, maybe only one or two bolls were open. I put some in the solar dryer in late October and left them there several weeks. Not all opened, but a good many did. In another cotton bed I left the bolls on the frost killed plants. Some opened eventually, but not many, so I brought the harvest from that bed in the house and put all the bolls on the solar dryer screens near the woodstove. More opened, but not all. This was the cloudiest summer I ever remember and cotton likes the sun. I believe that is the reason it didn’t mature. To support the screens in the house, I set up the wooden clothes dryer rack and noticed that some of the rods are even with each other. I put the screens across those. If you don’t have a woodstove, you could locate the rack near a window or near a heat vent. I know it’s been an icky year. I did put some of the more mature bolls on the dashboard of my car to see what that would do. Some of these bolls that I put there are shall we say cracked slightly….so they aren’t far from bursting to begin with. I don’t expect anything from those that didn’t mature. The dashboard of your car is a good idea! Got a question for you. I know we spoke at the guild meeting and I told you about what may potentially happen down the road. I’m considering planting some cotton but at first starting them in the pots since our weather is being so fickle right now as you know. Question is though….say later this year before the cotton bolls fully develop into the cotton we have to move…could the cotton plants be transplanted to the new property without hurting them too badly? I don’t believe that cotton will transplant well once it has some size to it. You could grow it in large pots this year. That would make it easier to move if necessary. Judith has experience growing cotton in pots and some others in the guild may have done that, also. The problem with pots is that you have to remember to water them. Good luck! I sincerely appreciate this blog….. Doing for yourself is the only method to self discovery. We all have gifts and talents, we can find them in nature of such a large variety, it takes cotton and its spinning to bring it to light. Gandhi made one fatal mistake….. he should have said to his people “do it for yourself” not in a humble way. Meaning, every dog has its day, and his approach was in protest for a country that should have never been seized in the first place. They were used and than traded. Sounds like slavery to me. Life is about the 10 commandments dude. He should have guided them in this way: Spin cotton for yourselves, they needed us anyway.